Learn to control your asthma. Asthma is one of the most common lifelong chronic diseases. There are 26 million people in the United States living with asthma, a disease affecting the lungs, causing repeated episodes of wheezing, breathlessness, chest tightness, and coughing. Although asthma cannot be cured, it is possible to manage asthma successfully to reduce and prevent asthma attacks, also called episodes. Successful asthma management includes knowing the warning signs of an attack, avoiding things that may trigger an attack, and following the advice of your healthcare provider. Using what you know about managing your asthma can give you control over this chronic disease. When you control your asthma, you will breathe easier, be as active as you would like, sleep well, stay out of the hospital, and be free from coughing and wheezing. 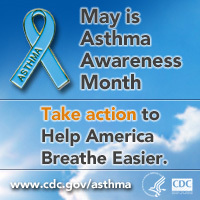 To learn more about how you can control your asthma, visit CDC’s asthma site. Asthma affects people of all ages and backgrounds. In most cases, we don’t know what causes asthma, and we don’t know how to cure it. Certain factors may make it more likely for one person to have asthma than another. If someone in your family has asthma, you are more likely to have it. Regular physical exams that include checking your lung function and checking for allergies can help your healthcare provider make the right diagnosis. With your healthcare provider’s help, you can make your own asthma management plan so that you know what to do based on your own symptoms. Use your asthma medicine as prescribed and be aware of common triggers in the environment known to bring on asthma symptoms, including smoke (including second-hand and third-hand cigarette smoke), household pets, dust mites, and pollen. Limit or avoid exposure to these and other triggers whenever possible. The important thing to remember is that you can control your asthma. To learn about how CDC supports state asthma control programs, see our Success Stories from CDC’s National Asthma Control Program, National Center for Environmental Health, Division of Environmental Hazards and Health Effects.